Earth Observation (EO) is the most effective way to monitor the environment of our changing home planet. 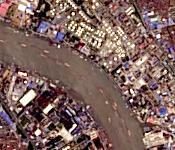 The latest significant contributions by the U.S. and the European Union countries are the successful lunch and operation of Landsat-8 and Sentinel-2 satellites. Their high-quality and rich multispectral data covering very large acquisition areas are freely available and provide enormous opportunities for innovation and applications. 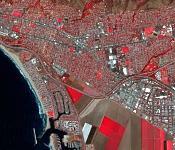 They are "YOUR satellites" and highly complementary (even competitive for many applications) to high-resolution imaging. 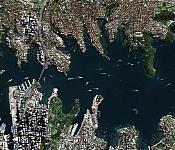 We wish to help users quickly realise the full potential of the latest Landsat and Sentinel imagery. 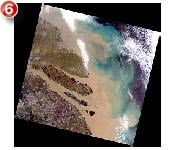 Our aim is to develop the highest-quality 10m-resolution Sentinel-2 and 15m-resolution Landsat-8 imagery composites (in natural and false colours). Quality matters! 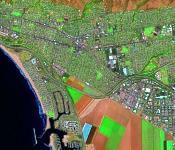 "I have found ST for Landsat-8 Imagery to be my most useful tool in working with the OLI images. Thanks for developing these tools!." (Email from a retired industry veteran, January 2016)"
Popular software for geospatial professionals and general users. It is productive and saves time! Functions include band combinations, image stretching, image pan-sharpening, and exploratory image feature extraction. 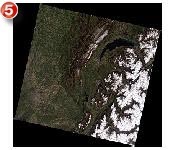 Perfect software tool to get the daily fresh Landsat-8 imagery into GIS and remote sensing software, and Google Earth Pro. 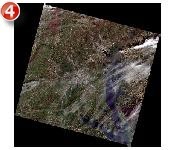 Updated 12/2016: Supporting the Landsat-8 data (in compressed GeoTIFF format) downloaded from AWS S3 Landsat-8 portal. Updated 06/2017: Refining the software GUI to accommodate the long file name of Landsat-8 Collection 1 Level 1 data. Recently, there are other avenues to rapidly download Landsat-8 imagery, e.g. 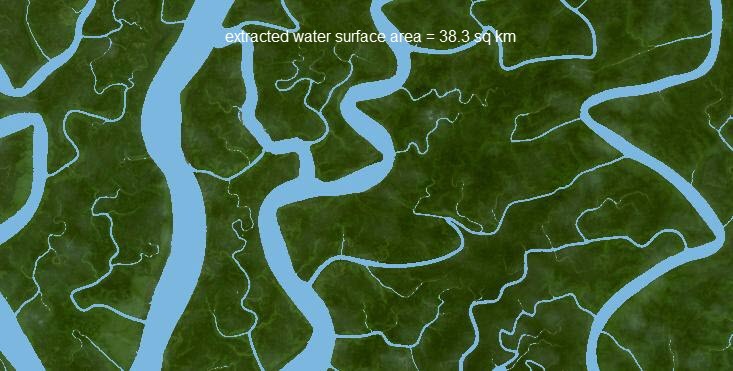 Libra (recommended for casual users, no registration required), EarthExplorer and GloVis provide Landsat-8 imagery data (all in uncompressed GeoTIFF format typically included in a single / bundled zip file), which can be directly analysed by Spectral Discovery software. 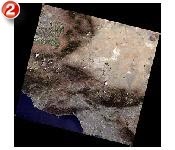 For the Landsat-8 Collection 1 Level-1 standard data product, a pixel is commonly represented by a Digital Number, not the true reflectance of land surface. 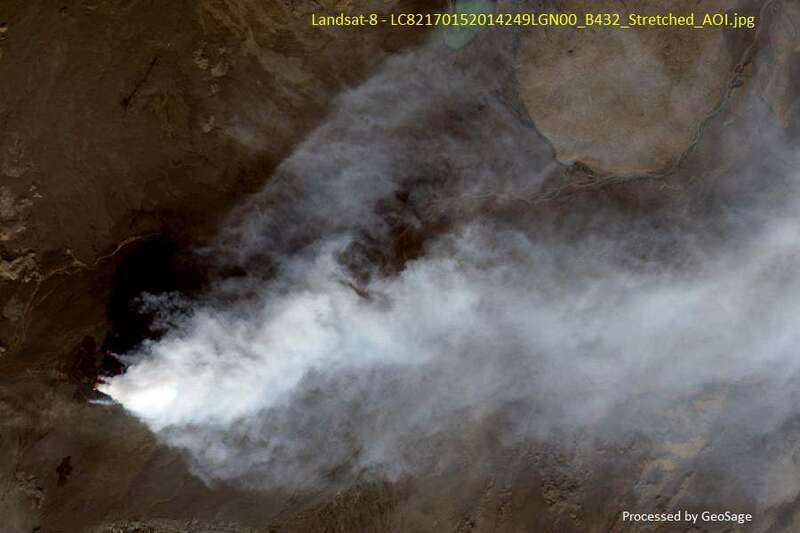 The Landsat-8 data from AWS S3 or other sources may be in compressed GeoTIFF format. 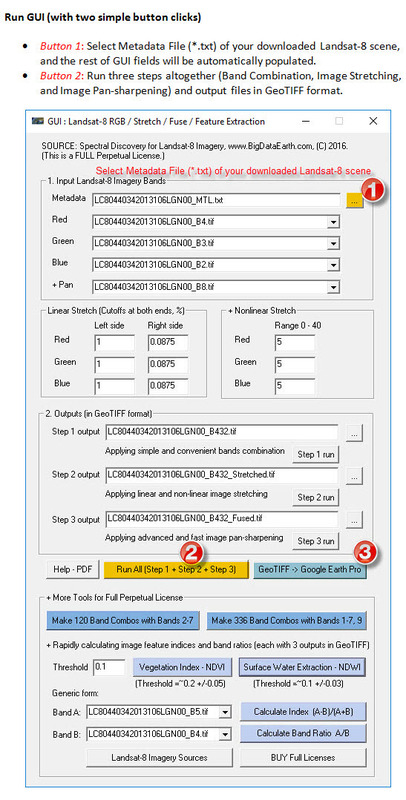 Spectral Discovery software uses the tool (gdal_translate.exe) included in open GIS software QGIS to make format conversion first before analysis. 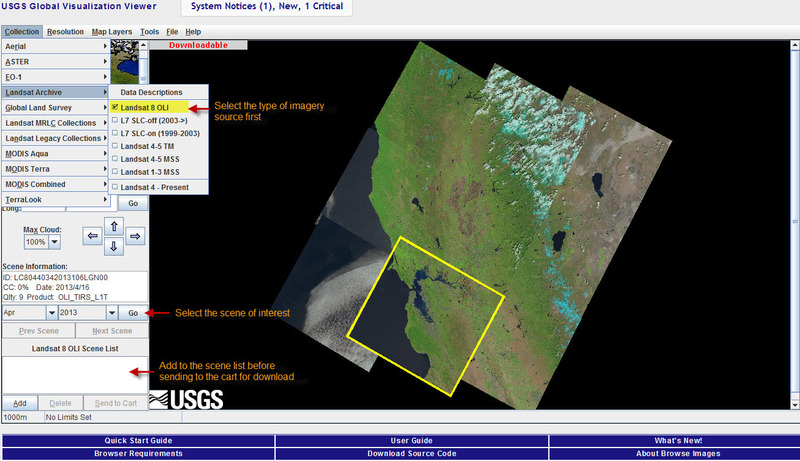 The USGS Landsat portal provides comprehensive FAQs in relation to the new Landsat-8 imagery and its comparison with the previous Landsat series. It is important to read these before conducting proper image processing. 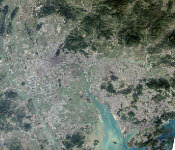 Landsat-8 products are delivered as 16-bit images with the panchromatic band at 15m resolution and multispectral bands at 30m resolution, and band combinations are unique (e.g. bands 4/3/2 refer to red/green/blue, respectively, useful for making natural colour composite). An overview of some common band combinations for better discrimination of various ground features is provided here, there, but one should not be limited by given prescriptions. While the imagery source is magnificent, more work needs to be progressed on how to use the imagery in a straightforward way. 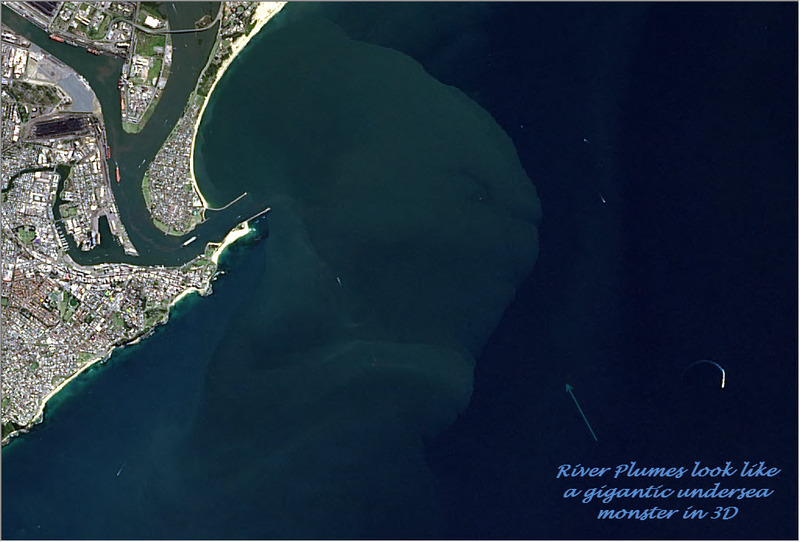 There are many remote sensing and image processing software tools on the market, but it is fair to say that very few can efficiently make beautiful, detail-rich imagery composites with adaptive image histogram stretching and advanced image pan-sharpening. One may spend hours to produce something that is of high quality. For many GIS users, it is often hard to find right capable tools (i.e. band combination, image stretching and image pan-sharpening) in GIS software packages. And for casual users and the general public, dedicated tools to process the vast Landsat imagery archive are lacking. 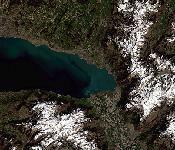 Spectral Discovery for Landsat-8 Imagery fill in this gap. 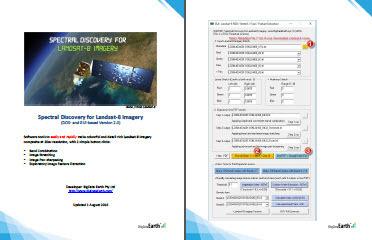 We believe these tools are very useful for a wide range of users who are interested in analysing the latest Landsat-8 imagery. 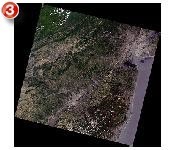 These powerful and easy-to-use tools specifically target Landsat-8 imagery in GeoTIFF format directly downloaded from the USGS Landsat-8 distribution portals (e.g. USGS EarthExplorer or USGS GloVis) and Libra. For a scene with little cloud cover or fewer white objects, these image stretching options (-s 2 0.2 2 0.2 2 0.2 5 5 5) would suffice. If a scene contains a large proportion of white objects (e.g. cloud and snow), try to increase the right-end cut-off values in image histogram stretching for their exclusion. To improve the brightness of the imagery composite, one may increase non-linear stretching values to 10, 20, 30 and so on. The first pan-sharpening method (1) would perform better for the majority of cases. This choice may be subject to the size of image objects in the scene (i.e. ground features). Output files from image stretching and pan-sharpening, if exist, will be over-written automatically. The same procedure equally works for any three-band combinations. Through iterations, any number of multispectral bands can be fused and pan-sharpened. To avoid typing long file names in DOS console, one can simply drag files to the console. One may prepare DOS batch files to efficiently run tools with various image stretching and pan-sharpening options. 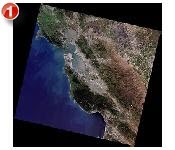 The band combinations and image stretching tools may be used to process the generic 8- or 16-bit remote sensing imagery. It is with great privilege that we all have access to such a superior imagery source. We are motivated and have tried our best to develop the tools that can preserve that high quality as much as possible. We are confident that anyone even with little image processing experience can perform the above analysis. 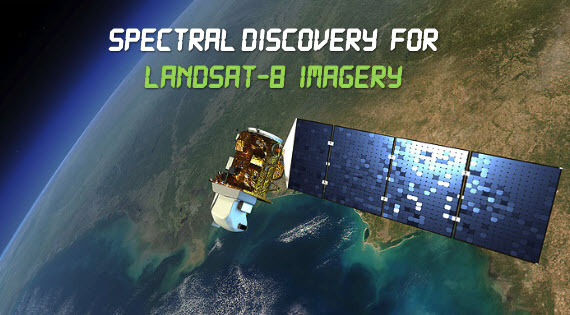 It is our hope that more people can take advantage of and benefit from the excellent Landsat-8 imagery. Thank you, NASA and the USGS! A simple yet extremely powerful way of image (visual) analysis: Through rapid, various band combinations, important features/phenomena of interest on Earth land surface can be better highlighted and revealed. Example 1: Mapping fire scars (burnt areas) with numerous band combinations in an automated procedure. Left: The extent of fire scars being clearly revealed by Bands 7/5/3; Right: Natural-colour image with Bands 5/4/3. 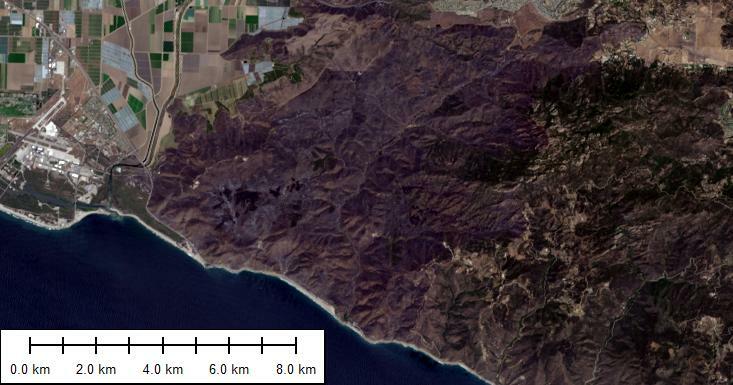 Location: Point Mugu State Park, California; Image source: Landsat-8 (scene DATE_ACQUIRED = 2013-05-13). 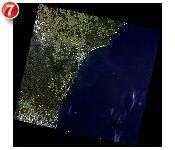 Example 3: Pan-sharpening of Landsat-8 imagery from coarse 30m-resolution (Left) to very sharp 15m-resolution (Right). 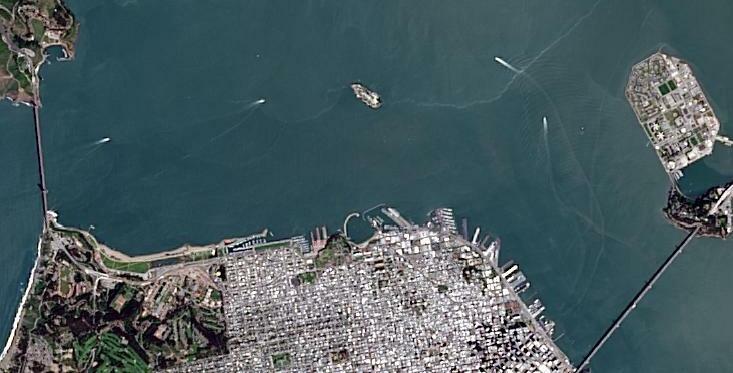 Location: San Francisco; Image source: Landsat-8 (scene DATE_ACQUIRED = 2013-04-16). 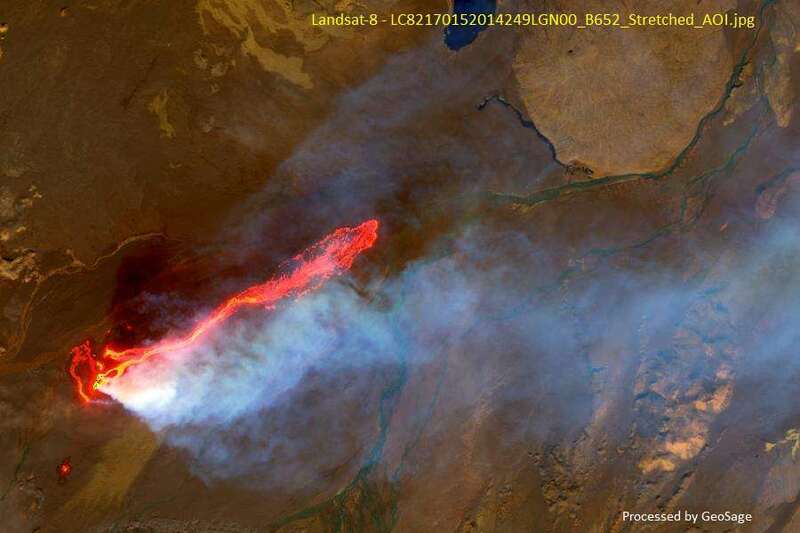 Landsat-8 short-wave infrared (SWIR) bands are capable of detecting wildfire hot spots and lava flows/heat through smoke. Exploratory image feature extraction with image indices (e.g. 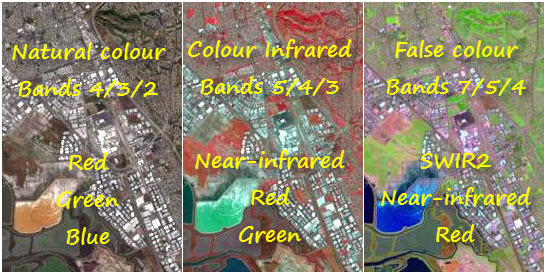 Normalised Difference Vegetation Index - NDVI, Normalised Difference Water Index - NDWI, Normalised Difference Urban Index, Normalised Difference Snow Index, Burned Area Index) and various band ratios, for a wide range of environmental studies. Example 5: Classifying and estimating water surface areas in an automated procedure. Left: Extracted water surface shown in light blue; Right: Natural-colour image with RGB bands. Location: Sundarban, Bangladesh; Image source: Landsat-8 (scene DATE_ACQUIRED = 2015-11-12). 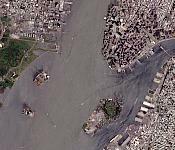 Need a global satellite imagery mosaic? 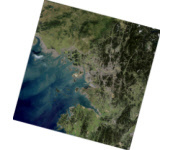 Please take a look at the high-quality global satellite imagery mosaics (30m-resolution, multiple styles) in ELS2000 series. 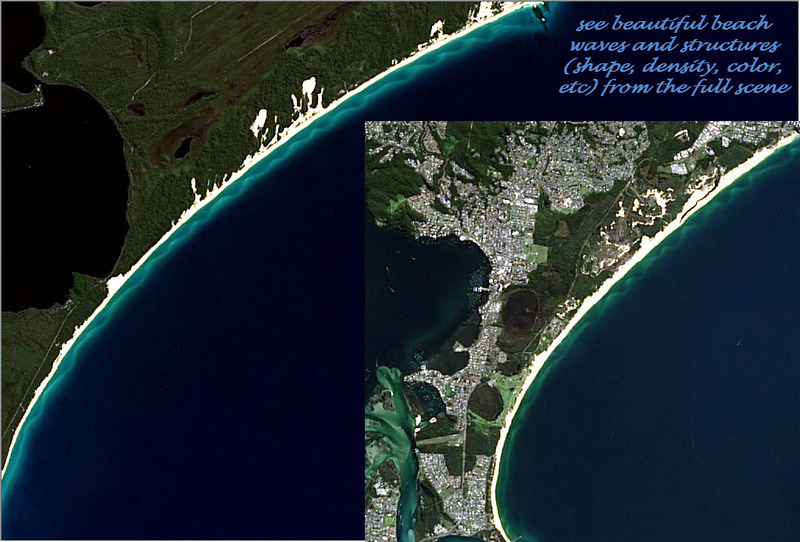 Truly natural-colour, full-scene examples for the "Vivid Earth" series - To view our land more clearly and colourfully! Be the judge on the performance of the tools. Quality Matters! 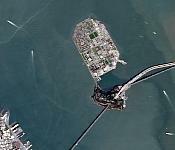 Full-scene, pan-sharpened result at 15m resolution in GeoTIFF, ready to be used in all GIS and mapping software (e.g. QGIS, ArcGIS, MapInfo), popular image-editing software (e.g. PhotoShop), and Google Earth Pro. 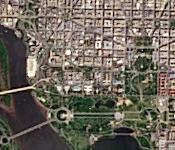 The size of each processed full scene in a compressed form is only about 5% of that of the raw data in GeoTIFF format. 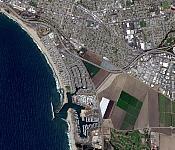 the potential for the broadest use of the new Landsat-8 imagery is great. "An enormous amount of spatial data sets has been produced and explored already, but the future for a bright, sustained geospatial industry and location intelligence business critically depends on the quality of spatial data."